The best thing about sweet potatoes? You can stuff them with all sorts of fun flavor combinations – and use the skins as the bowl. Here are three easy ways to give the old fashioned twice-baked potato a Paleo-inspired makeover. Since the sweet potato is so versatile, you can make them savory or sweet, breakfast-ready or dinner-worthy. Plus, they’re chock full of vitamins, fiber, and antioxidants (1) for a healthy nutrition boost. To get you inspired, we created three easy recipes that require only a handful of ingredients. We start with an eggs and bacon breakfast recipe, highlight the dessert-worthy side of sweet potatoes with a maple syrup and apples dish, and finish with a hearty chicken taco “bowl”. This easy slice-and-stuff method will keep you full from dawn to dusk! To save on time, bake your sweet potatoes the night before — they store nicely in the fridge as long as they’re wrapped in foil or kept in a covered container. With pre-baked sweet potatoes, these recipes will only take you 20 minutes, tops! Eggs are baked right inside a sweet potato and topped with bacon for the ultimate filling breakfast. Pierce the skin of the sweet potato with a fork 5-6 times, cover in aluminum foil, and bake sweet potatoes at 400°F for 45 minutes. Cut the cooled sweet potato into two halves, and scoop out enough flesh in the middle of each to make a “basket”. Break one egg into each sweet potato half. Top with bacon and enjoy! Maple syrup, pecans and apples play up the sweet side of the sweet potato. Cut the cooled sweet potato in half, and scoop out the flesh. Mash up the sweet potato pulp, then mix in apples, pecans, maple syrup and cinnamon. Add mixture evenly to each sweet potato half. Bake at 350º F for 15 minutes. Top with more maple syrup if desired, and enjoy! Top a baked sweet potato with all the fixins of a Mexican-inspired taco bowl. Cut the cooled sweet potato in half and scoop out enough flesh to make a “bowl”. Top with chicken, guacamole, tomato, onion, bacon and chives, and enjoy! 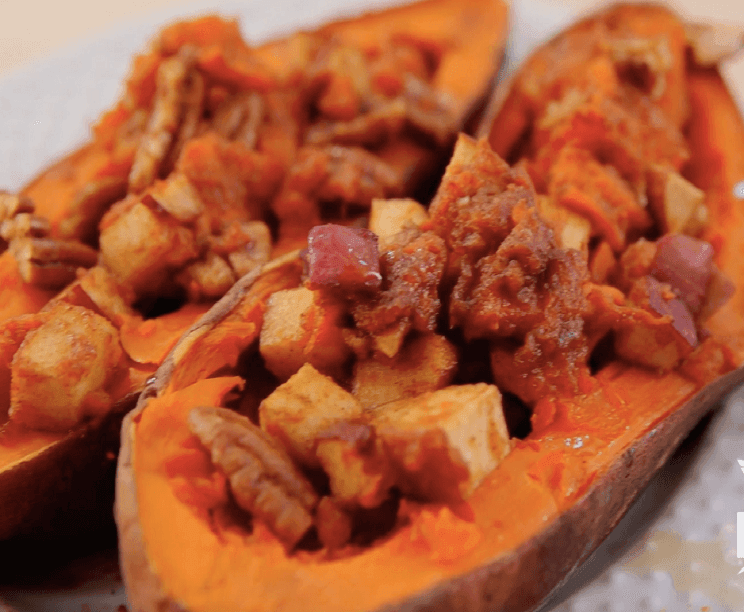 Watch How to Make Sweet Potatoes, 3 Ways!